I had a hard time deciding what I wanted to post about this week. As I considered my options, the one theme I kept coming back to was classroom management and dealing with behavior issues. There are so many topics that can be addressed under these two big ideas. I decided to start with using physical space, routines, transitions and teaching strategies to prevent challenging behavior. I will address how to effectively use time out, setting and following through with boundaries, and punishment, praise, and rewards in my next several posts. You can imagine that with almost 20 years of classroom teaching experience I have seen many challenging behaviors in some of my students. Over the years, I turned to colleagues and administrators, professional reading, and personal experience to try and work through these issues. 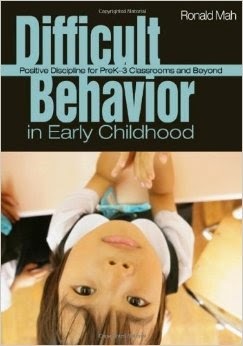 Two books that have been very helpful are Difficult Behavior in Early Childhood: Positive Discipline for PreK-3 Classrooms and Beyond and Challenging Behavior in Young Children: Understanding, Preventing, and Responding Effectively. I expect that some of what I am about to share will be what you already do, while other ideas will be strategies and tips you have heard about or used to do and have moved away from. In some cases, the ideas may be new to you or you may have never considered the impact they have on classroom management and behavior. Regardless of whether the ideas I am about to share affirm you for what you are already doing, push you to go back to something you used to do, or move you forward to try something new, I hope this post will help you prevent challenging behaviors in your students through classroom setup, routines and transitions, and teaching strategies. 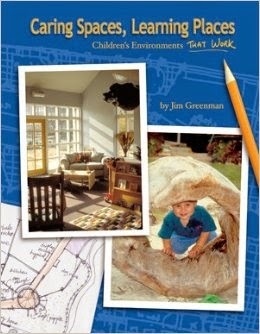 In his book, Caring Spaces, Learning Places, Jim Greenman wrote "Space speaks to each of us." For example: consider a restaurant, a library, or baseball field-- each of these spaces lets you know exactly what behavior is expected there. The same is true for a classroom. The overall layout of the classroom, the arrangement of the furniture, and the use of wall space will determine if students feel comfortable or apprehensive, calm or out of control, inclusive or elitist, social or threatening. It is most definitely easier to change the physical space of a classroom than to change student behavior, but ironically, altering the space can change behavior. 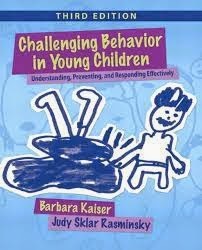 Young children with challenging behaviors oftentimes have trouble functioning in a physical space permeated with rules and restrictions. While all children need some limits, too many set limits may make matters worse. Eventually, young children will stop listening (which can be dangerous in the case of an emergency), therefore it makes sense to organize the room so that children can move freely and without constant redirection or guidance. 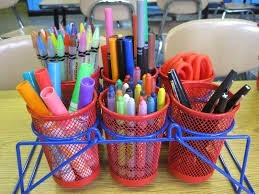 As you arrange and organize things in your classroom. consider the empty space. Too much open space encourages running, chasing, and chaos. Use low shelves and other furniture pieces to separate large spaces into uncluttered, well-organized areas. Mark boundaries clearly and lay out well-defined paths from one location to another. There are different lines of thought concerning seat assignments. 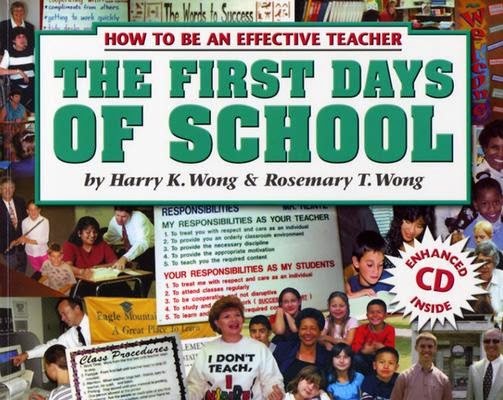 While it is oftentimes a best practice to let students make decisions and have choice, in their book, The First Days of School, Harry and Rosemary Wong suggest preparing seat assignments for students. This allows you to mix up students who are close friends, promote social skills, and empower diverse talents and intelligences to emerge. For those students who are easily distracted, you can cut down on the stimulation around the room by placing them away from windows and high traffic areas such as doors, the trash can, the sink, and the bathroom. 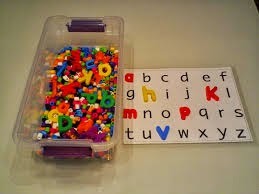 Rather than taping names down to the table, use velcro so they can be easily moved. The materials, games, center activities, and books you choose have an effect on your student's behavior. To engage students, consider their interests, abilities, culture, and developmental levels. Materials that are too difficult can easily turn into simple figures such as a gun or sword. Competitive games and games that require a lot of waiting can encourage aggressive behavior. 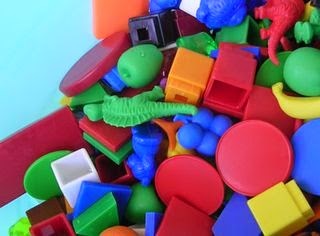 Tactile experiences with play doh, sand, and water can help a child to relax and move through difficult stretches and materials such as parachutes and group projects can incite cooperation. Classroom noise can make it difficult for some children to hear, focus, talk quietly with others, and settle conflict peacefully. As you move through the room during the day, pay attention to the noise and hubbub. Possible suggestions for reducing stimulation: turn music off, leave some areas of wall space blank, put away some of the materials, decrease clutter, organize children's artwork by color, and dim the lights by turning one off or using lamps throughout the classroom. Help your students settle into learning through predictability, consistent expectations, and a daily schedule. Post the schedule to help children remember and refer to it throughout the day. Develop and teach procedures to establish predictability. Procedures and routines are the grease that make the classroom run smoothly. Teaching procedures can cover everything from entering the room in the morning to packing up to leave in the afternoon, attending to personal needs, transitions, participation in teacher-led activities, working in small groups and at centers, getting help, and handling materials and equipment. Introduce only a few procedures at a time. Start with those students need first such as entering the classroom, using the restroom, putting their backpack away, etc. Before starting a new activity, always teach any procedures that go with it. Review procedures regularly and post procedures along with visual cues. Children are motivated and empowered when they can make meaningful choices about the way they spend their time. If you build choice into your program and give children the opportunity to make their own decisions, they don't need inappropriate ways to seek power and independence. Children who feel anxious when no one is directing them will manage better if you reduce their choices and remind them to ask for help. Too many materials can breed confusion, but too few can create conflict. One possible solution is to provide duplicates of popular activities and materials. For those students who have trouble sitting still during group time, offer them the choice of quietly leaving the carpet and reading a book, drawing, or doing a puzzle instead. Make sure to create a procedure for leaving and returning. Consider students' learning preferences such as do they prefer bright or soft light, quiet or noisy surroundings, moving around or sitting down, working alone or with others, using sight, sound, or touch to understand material. Intelligence preferences also impact learning. 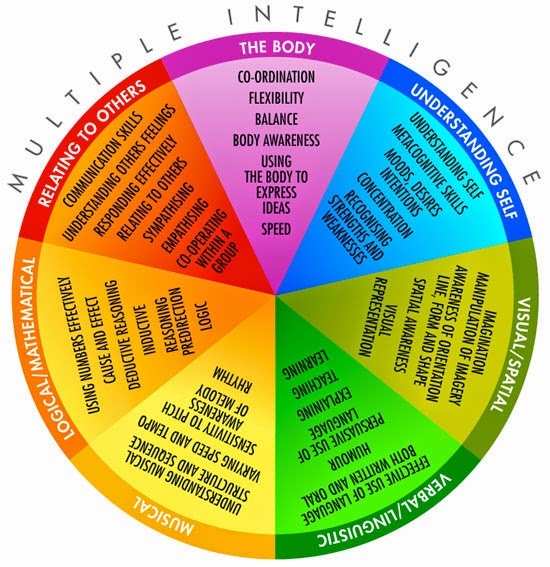 According to Howard Gardner (1983), different minds work in different ways, so some students will fit into conventional methods such as linguistic or logical-mathematical, while others will fit into others such as musical, spatial, kinesthetic, naturalistic, interpersonal, intrapersonal, and existential. Play is fundamental to learning and essential to children's cognitive, physical, social, and emotional well-being. Be sure to set aside enough time for children to play. Teach with themes that will extend the content of their play. Choose props and materials that encourage children to develop their play skills. In small groups, young children can work together to achieve a common goal. Working in groups can also increase motivation, engagement, and academic achievement. Peer Tutoring- Older students can help younger students or children who are the same age can take turns teaching each other. Partner Learning- Young children can work in pairs to practice skills, complete academic tasks, follow routines, and practice their social skills. Cooperative Learning Groups- Children can work in small heterogeneous groups on multidimensional, open-ended tasks. Motivation is key. Research has shown that the motivated brain operates better and signals faster. Your students will be more motivated when they have choice and when the task is challenging, achievable, interesting and meaningful to their lives. Children's prior knowledge or schema is the starting point for new learning. Therefore, it is important to activate and work with that knowledge. KWL and schema charts are great tools for taking students' learning deeper. From Mrs. Jump's Class post Spiders! Have high expectations for your students, because your expectations for each student will influence what and how you teach. Your students will internalize your expectations and comply with them. Give students a say in what they will learn. Marzano (2003) suggests letting students set goals for themselves at the beginning of each unit or theme of study. Give instructions to students in small, manageable pieces. Provide concrete examples, visual cues, demonstrations, and sequence cards that list and illustrate each step. Give instructions in a clear and direct manner, using positive language. Variety will give an lesson a little spice. According to Jensen (2005), young children can pay attention for only about 5-8 minutes, so plan to frequently switch gears. Schedule your most demanding lessons during the time of day when engagement is highest. Place preferred activities such as centers or recess after demanding ones. Slow down to teach harder concepts and speed up to teach easier ones. Alternate tedious tasks with more exciting ones and alternate simple demands with difficult ones. Push your tolerance for the wiggles as far as you can. Resist using whole-group instruction for lengthy periods of time. Make movement and active participation an integral part of your program. 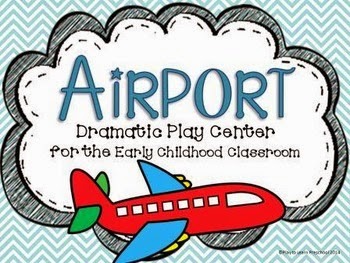 Some suggestions include moving furniture, joining and leaving groups, using centers, partners, and small groups, acting out stories and concepts, and turning lessons into games. In order to gain control over students who continuously speak without raising their hand, ignore shout outs, but when the child raises his/her hand, call on him/her immediately. 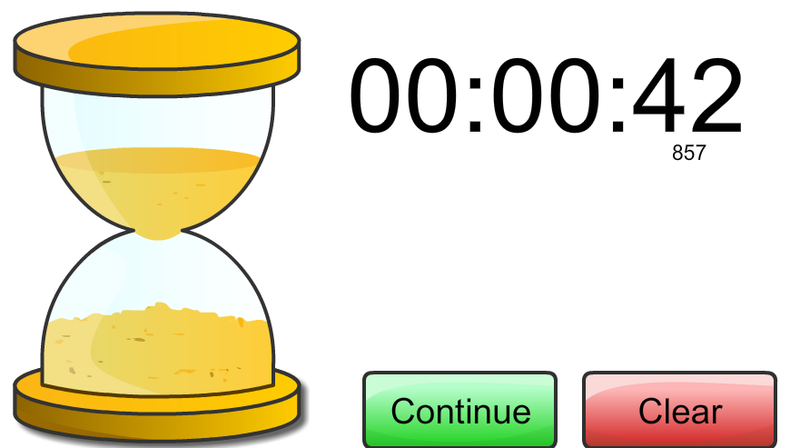 Help children learn to wait by using a timer that ticks or an egg timer that shows time passing. 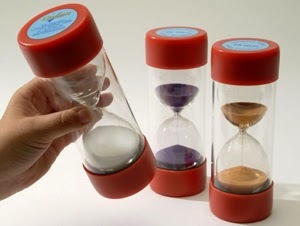 Research has shown that waiting at least 3 seconds for a reply or an answer will elicit longer responses. According to Jensen (2005), by allowing the brain to relax, recess enhances learning and helps children handle stress and conflict. If your recess time is nonexistent or limited or its a rainy day, extend the music, movement, and break time in your classroom. 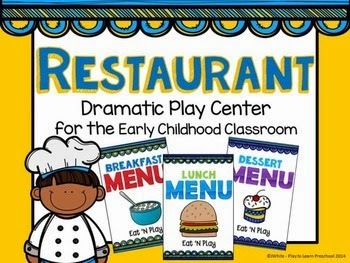 I was searching for center ideas for one of my teachers and I came across a TPT store with some great dramatic play units. 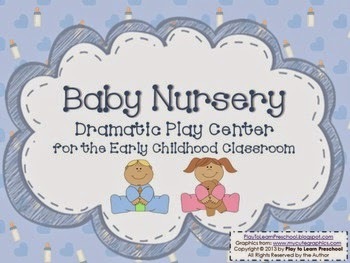 It's Play to Learn Preschool. 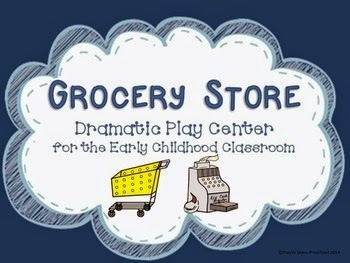 Jamie has a handful of great dramatic play units and they are $3 each or you can purchase all 6 for just $12. You can preview all of her units to see what labels and signs it comes with. Here are just a few of the ones she has. 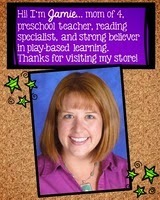 When I first began teaching kindergarten 20 years ago letter of the week was my primary focus. I loved my weekly letter routines and planning read-alouds, cooking, and art activities centered around the letter. Over time and through workshops and professional reading, I began to implement shared and interactive writing and to teach all of the letters everyday. However, for many years I continued to hold on to parts of letter of the week- brainstorming words that start with a certain letter, reading books all week that start with the same letter and switching center activities out and planning craftivities based on the letter of the week. Eventually, I broke away from letter of the week completely and begin teaching all of the letters in a way that was relevant and meaningful to all of my students. For those of you who are still clinging to letter of the week in any capacity, here are a few things for you to consider. 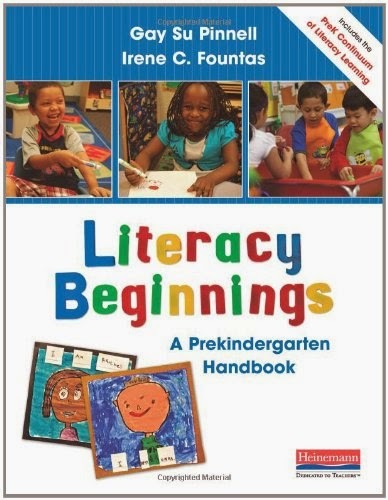 In their book, Literacy Beginnings: A Prekindergarten Handbook, Fountas and Pinnell state that the practice of "letter of the week" implies that letters are what child learn first and in a specific sequence and then they learn to read. When in reality, children learn the letters and how to read all at the same time. In fact, research indicates that the more connections children make between the multiple understandings necessary to read, the faster they learn the letters and how to read. Letter of the week may actually slow down how children learn letters and it does not help them make meaningful connections. You can support literacy development in your classroom through a wide variety of authentic and meaningful experiences. 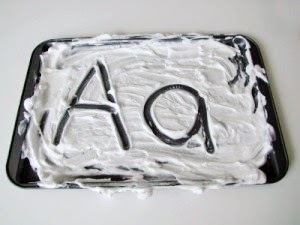 Here are a handful of alternatives to letter of the week. When you spend a lot of time on letter of the week, many of your students work on letters they already know, while others see and study letters out of a meaningful context. In some cases, student's forget the letter from the previous week while they are learning the new letter because they are only looking at one item at a time. In the book, The Intentional Teacher, Epstein writes that research has shown that there are four specific abilities that young children need to develop in order to become speakers, readers, and writers. Those abilities include: phonological awareness, comprehension, print awareness, and alphabet knowledge. Letter of the week does not engage young children in all of these areas, but reading books with rhymes, pointing out concepts of print as you read big books, providing students with opportunities for conversation, using student names for class books, name charts, and games, and drawing students' attention to the way letters are formed through letter sorts or verbal path directions does. I encourage you to examine your schedule and ask yourself these questions. How can you integrate literacy skills throughout your entire day and in all content areas?How can you weave literacy skills throughout your day to make your instruction more effective (through read alouds, reading and writing materials in every center, add props to centers to facilitate conversation, language learning, and alphabet knowledge)? Are you still teaching the letters in isolation? If so, how can you integrate their names into your instruction? I know many of you might be thinking that letter of the week and drill and practice activities are effective instructional strategies because you have used them for years and your students leave at the end of the year knowing the alphabet and its sounds. Keep in mind that just because a student can memorize something does not mean that they truly understand it or that they can apply it beyond rote memory. For those of you who are still hesitant or who are completely resistance to the idea of doing away with letter of the week, I give you this wonderful quote from Maya Angelou to consider "Do the best you can until you know better. Then when you know better, do better." Since my daily sign-in post, I have continued to receive lots of comments, emails, and questions concerning writing with young children, so I thought I would write another post concerning writing. In this age of accountability, increased "rigor," and testing, it seems that "writing" has come to mean one thing and the same thing across all grade levels and for all children. There is the misconception that teaching writing to young children means handing them paper and writing materials and sending them off on their own to write. When in fact, teaching writing to our youngest learners includes fine motor skills, an awareness of the purposes and functions of the written word, letter and word writing, and modeling... lots and lots of modeling. Writing, like reading, is dependent on children having certain perceptual motor skills. 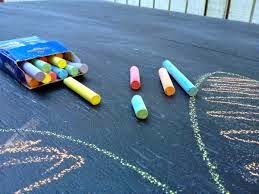 In order to write, young children need to be able to grasp writing materials and have the hand-eye coordination to make certain types of marks in specific places on a writing surface. Fine motor development is, to a great degree, maturational. However, early childhood teachers can provide materials and opportunities for their students to practice developing their fine motor skills. Early childhood teachers can provide materials in all areas of the classroom to develop children's dexterity and hand-eye coordination. 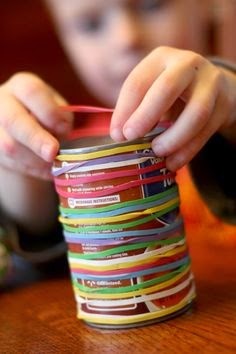 Some examples include: beads and string, dress-up and doll clothes with various types of fasteners, moldable materials such as play-doh, paper for children to manipulate and transform using scissors, a stapler, a hole punch, and tape, interactive technology that uses a touch screen, puzzles, etc. 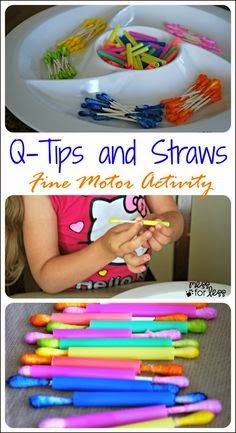 For more ideas on ways to incorporate fine motor development into centers, small group instruction, and lessons, take a look at my "Fine Motor Activities" Pinterest board. Here are just a couple of great ideas I have pinned from others onto my board. 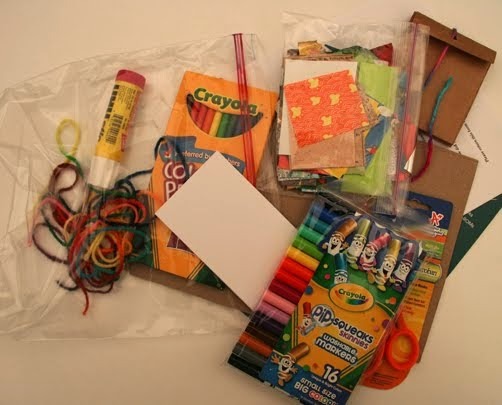 In addition to providing materials for developing children's fine motor skills, teachers should provide writing materials of all kinds throughout the room and in all center areas, encourage children to play simple games such as throwing a bean bag at a target, model how to hold writing tools and scissors, and pair students with a buddy for help. Young children oftentimes learn dexterity and coordination skills better by watching and imitating their peers rather than from direct instruction from an adult. **In early childhood, providing opportunities for young children to develop their manual dexterity and hand-eye coordination are part of writing. They should be incorporated all throughout the day and considered part of the daily writing routine. Young children need to understand that writing is done for functional reasons such as to communicate an idea, to remind oneself to do something, or to give directions and also for pleasure such as to tell a story, extend and invitation, say thank you, or preserve a memory. 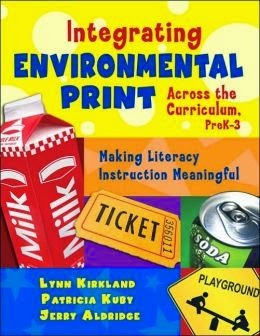 Provide contextualized examples of print such as material and center labels, rules created by the students, a daily schedule, cookbooks in the pretend and learn center, lists of children's names, anchor charts created with the students, to do lists, morning message, and authentic student writing. Like letter knowledge, letter and word writing are highly dependent on explicit instruction, but to be effective, it must be provided in relevant and developmentally appropriate ways. Call attention to how letters are formed, specifically the lines and shapes that make them up. I posted the other day about how describing the directional movements aloud is helpful. While your students, especially ELLs, may have a difficult time with these directions as first, you can have them practice by sky writing the letters. In some cases, you may want to stand behind the student and guide his or her hand and finger as he or she says the directions with you. Just as you build vocabulary in other content areas, you will have to build in when demonstrating for students how to form letters. Engage children in writing and reading their writing through dictation. Write down what the student says, read the words back yourself, and then ask the student to read back the words you wrote for them. Engage students in writing each day. Examples might include daily sign in, to do lists, morning message, and literature response activities. How do children learn to see themselves as writers? They learn from demonstration and participation and by trying it out for themselves. Shared and interactive writing, with the whole class or in a small group, allow young children to participate in the writing process with a high level of support. As children are given more and more opportunities to experience the writing process, they will begin to want to write for themselves. In shared and interactive writing, you and your students compose and write a text together that is then available as reading material. The two processes are similar in that you are composing the message together as a class or small group. In shared writing, the teacher is the only one using the pen and in interactive writing you "share the pen," occasionally asking a student to come up to the chart or dry erase easel and write a known letter, place a hand to "hold" a space while the next word is being written, write a letter that is connected to a sound students heard in the word, write a known word, or write his or her name. In both shared and interactive writing, spell words aloud as you write them, make comments to highlight writing conventions as you read and write them such as "This is a new sentence, so it begins with a capital letter", and use punctuation while writing with children. As children observe what you write, explain the marks and their significance. 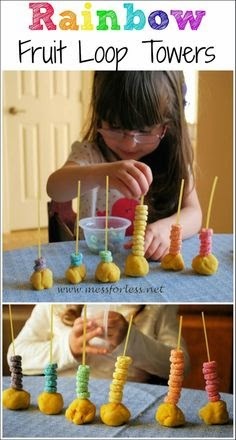 **Consider the amount of time you are asking your little ones to sit still while you do this. Start with one sentence for your youngest writers. Be quick and simply expose them to the writing process and conventions. Over time and as students develop, you can begin to write more than one sentence together. Comment positively no matter how children go about writing their names. Regardless of whether a child writes with up and down strokes, continuous linear scribbles, partial letter-like units, inverted letters, or conventional print, find a way to make a positive comment about the child's writing. For example: I see you have written the A at the beginning of your name, Abby, I see you have written your name A-b-b-y, You wrote your name using lines and dots, I see your name has two n's in it, etc. Last week I made a post about morning sign-in. It prompted a few teachers to ask me why I said young children should not trace their names, but write them on their own. Here is what I believe is the answer to that question. 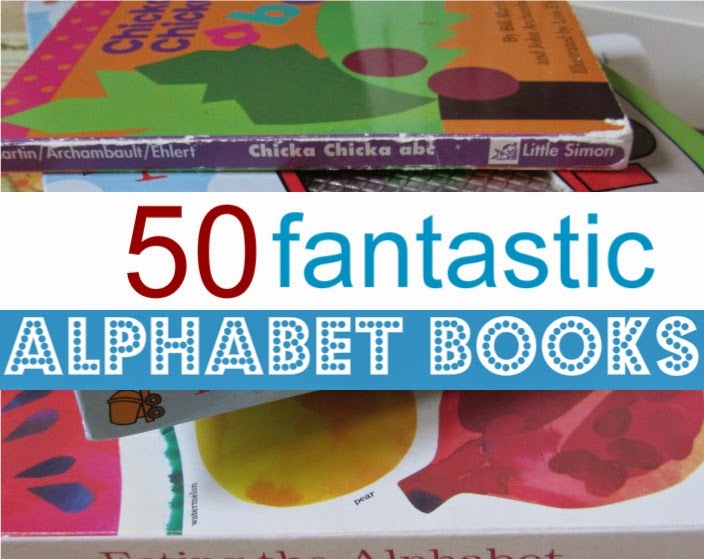 It requires very little thought for a young child to trace letters or words on a page. He or she does not have to consider left to right directionality, how to form letters, or how to make connections between letters and sounds. Tracing letters and words also fails to provide young children with a purpose for writing, it does not represent an attempt to communicate an authentic message, and in most cases, it is not considered an enjoyable task. When young children are beginning to learn to write letters. 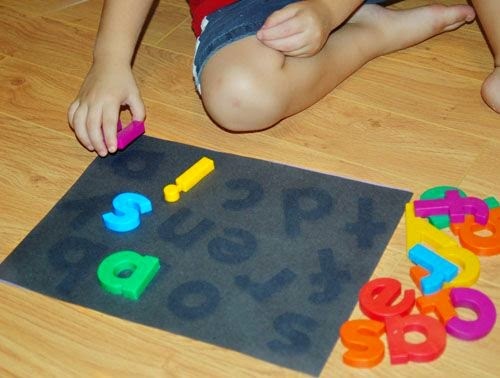 learning the specific directional movements for forming the letters can help them make efficient, legible letter forms. Pairing the verbal path descriptions with the motor movements helps little ones form letters more easily. Eventually, the child will internalize the language and the actions will become automatic. By verbal path, I mean the directional motions that demonstrate how to form the letter. For example, as you make an "a," you can say, "pull back, around, up, and down." Children can initially make the letters in the air using larger movements. Be sure to use the same language each time you give directions for letter formation. Consistency is very important. 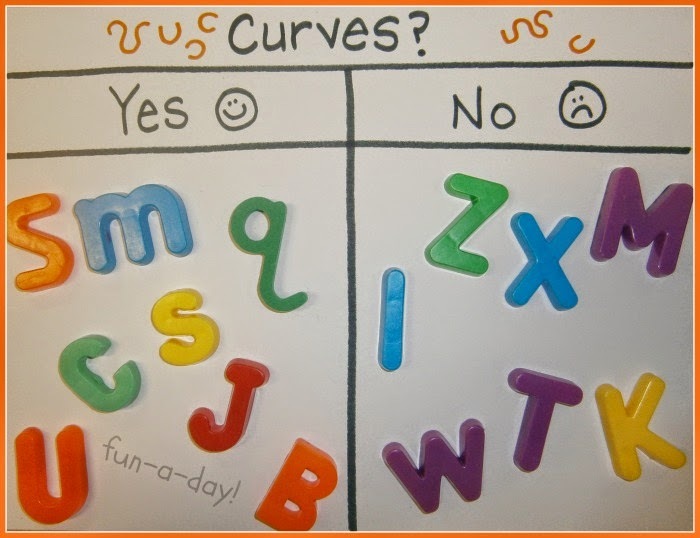 Help children notice the letters they form well. Be careful not to overdo letter formation prompts when children are first learning to make marks, lines, and scribbles on paper. Young children first need opportunities to explore and experiment with making marks on paper without pressure or restraint. Early attempts at writing are valuable experiences for young children. Through likeness and demonstration, they steadily gain a complex understanding about communicating through writing. For the young child, writing for oneself is an opportunity to solve problems and with appropriate adult support, he or she can learn a great deal and also feel the power of writing. 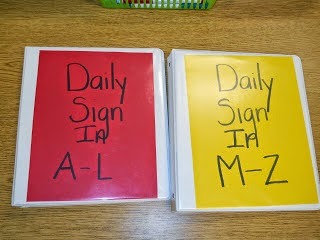 In my district, we ask our PK teachers use some type of student sign-in as part of their morning routine. I was in a classroom the other day and the class sign-in chart caught my eye. I was amazed at how well the students were already writing their name when just 5 weeks earlier they were only drawing lines and scribbles on the sign-in chart. That experience is what prompted this post. 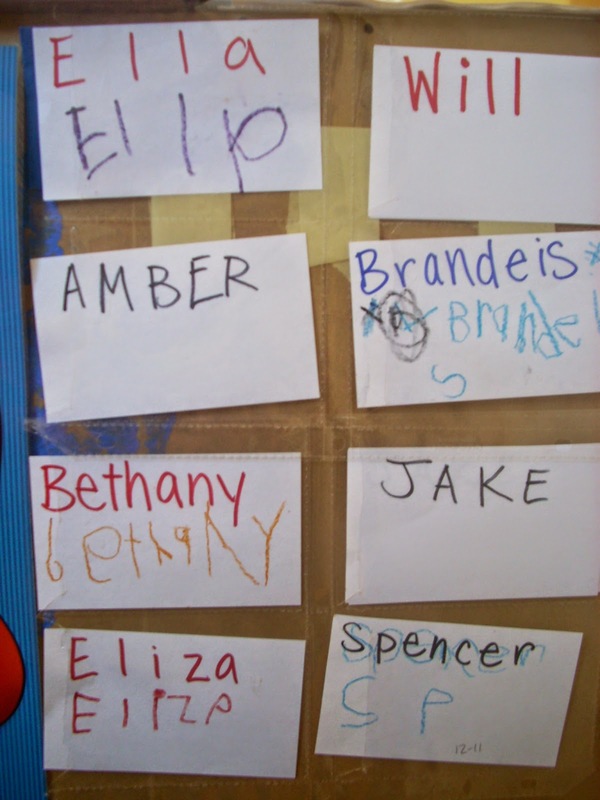 Young children come to school with a wide range of ability levels when it comes to recognizing and writing their names. The differences may be due to the length of their names and which letters are included in them, a difference in age, varying rates of development in fine motor skills, and even a varied interest in writing. One way to address this challenge with preschoolers and make the most of your instructional time is to implement a sign-in system as part of your morning routine. Begin by teaching your students that each day as they arrive their job is to sign in. You will have to do a lot of modeling and reminding, but eventually your little ones will rely on the predictability of the routine and remember to sign in on their own. There are a variety of ways to have your students sign in each morning. This example came from Not Just Cute: Intentional Whole Child Development. Amanda uses photo holders and index cards to have her students sign in. She writes the child's name at the top of an index card. The children locate their name card when they arrive, then write their names on their cards. Amanda dates her cards each day and keeps them as a way to track her students' progress. This example came from Teach Preschool: Promoting Excellence in Early Childhood Education. Deborah has her students sign in each morning using a clipboard. When students arrive, they find their name on the printed list and write their name in the space next to it. Here is another example of this same idea. This example is from a classroom in my district. This teacher uses a picture of the student instead of their name and has the clipboard lists grouped by who sits together at a table. I suggest using the student's name and their picture. 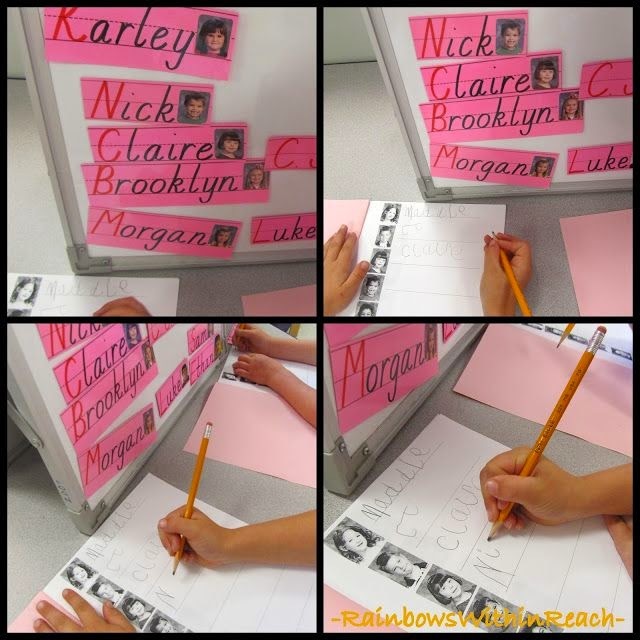 Students need a well printed model to look at when learning to write their name and their picture gives them a visual as they learn to recognize their own name and the names of others. 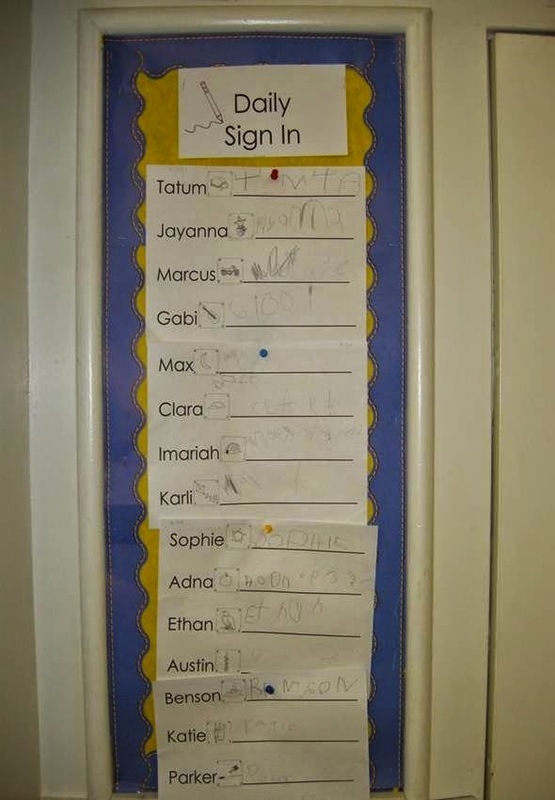 This example is from Rainbows Within Reach and it incorporates both names and pictures for student sign-in. This example came from Learning and Teaching Preschoolers. 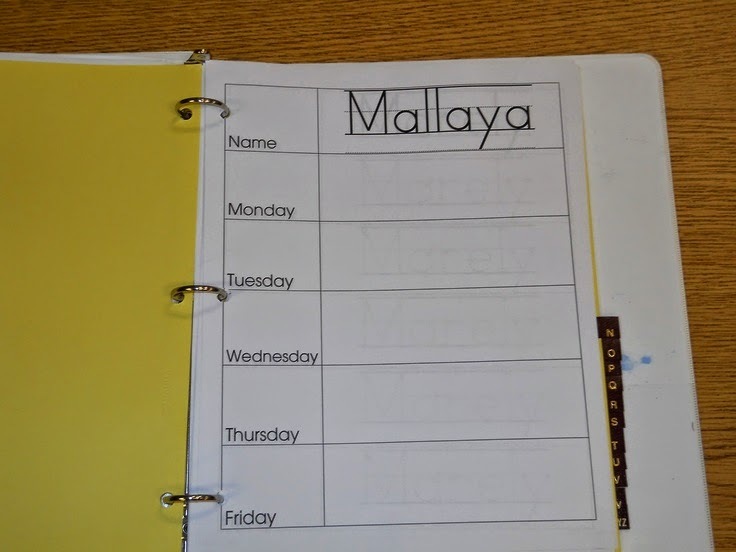 Tami uses two notebooks so that two children can sign in at one time. 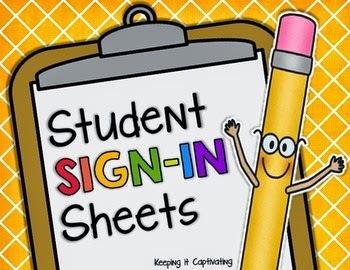 I like this example because it allows you to keep the sign-in pages from week to week so that you can show growth throughout the school year. Here is another example I found on Pinterest. Unfortunately, it did not lead back to a webpage or website. This example uses a dry erase board and comes from a model classroom in my district. There are student names and pictures on both sides of the board. This same idea can be recreated on poster board or chart paper. 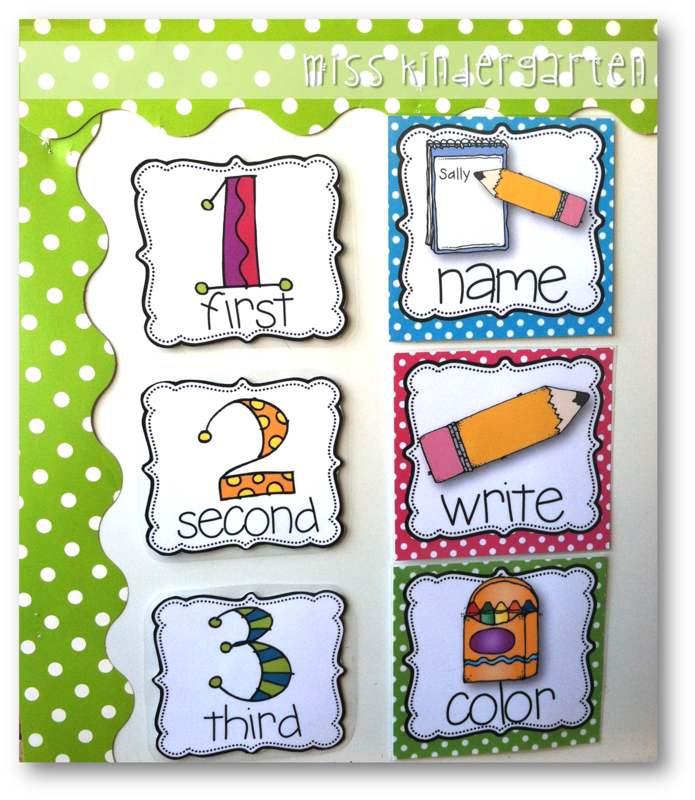 Create the sign-in adhering the name/picture cards onto a couple of sheets of poster board or piece of chart paper. Then laminate the poster board or chart paper. 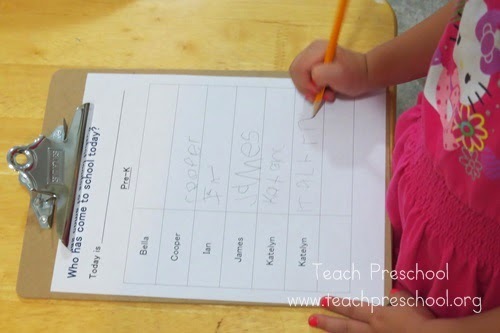 Students can use dry erase markers to write their name each morning and you can wipe it off each afternoon after they leave. This method does not allow you to track their progress, but it saves time and paper for you. 1) Provide students with a model of their name to look at when writing. In the beginning, I highly recommend including their picture with their name. 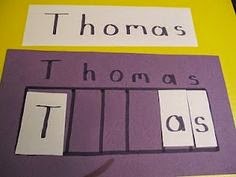 2) The model of the child's name should be written so that the first letter is a capital letter and all of the other letters are lowercase letters. 3) Do not include last names until after Christmas. 4) Give students plenty of space to write their name in. 5) Do not have them trace their name. Encourage and validate any marks students make for writing. Give instruction within the Zone of Proximal Development. When needed, choose one aspect to correct or offer instruction on. For example, letter formation. You might choose to do this during small group instruction while the students are in centers. Point out all of the positive aspects you notice when looking at their names. Your students will grow as writers when their work is praised and when they have a good model to follow. Don't weigh them down too much with corrections. This can make the task of writing frustrating and unappealing. I found this unit on TPT. 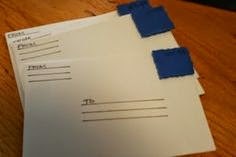 It is a pack of editable student sign-in sheets. You can easily go in and add your student's names and their pictures. Find this unit, by Keeping it Captivating, here for $5.